I know, its taken me forever, right? I’ve finally succumbed to my WAH nail urges and got myself a set of nails that ooze cool. Not content with trying my own DIY versions at home I needed the real deal. It prompted one of those dilemma scenarios which had me all a flutter in choosing which design to adorn my nails with. 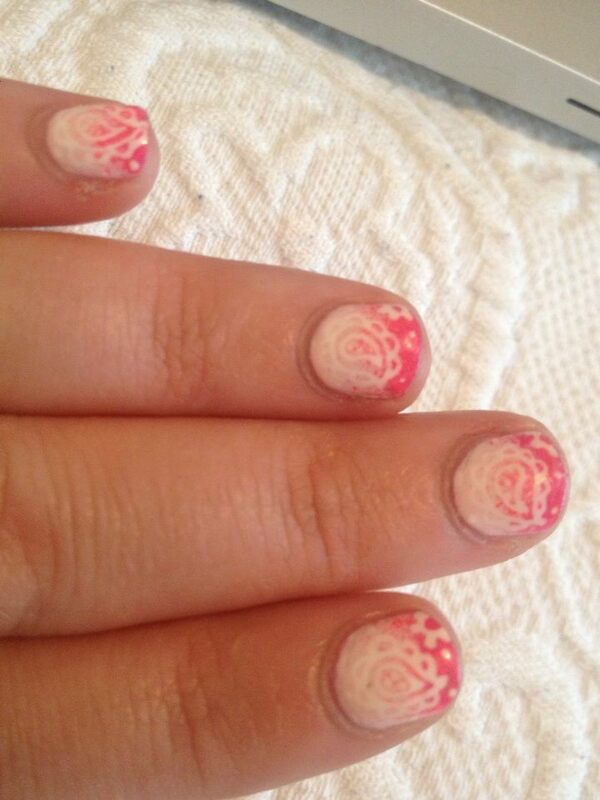 After much deliberation, I settled for the pink fade with a white paisley overlay – pretty cool, huh? I’m not normally a pink kind of gal but when in Shoreditch, you’ve got to experiment a little and I’ve got to say, my nail polish collection needs to make room for some pink neighbours as I feel a love affair coming on for Summer. WAH has such a chilled out vibe and the girls seriously scream 90’s cool. The brainchild of founder Sharmadean Reid, WAH is celebrating a huge wave of popularity and it’s not surprising the brand is going from strength to strength. Originating in Dalston it has multiplied into Topshop and collaborated with the likes of Models Own and ASOS; not bad shoulders to be rubbing with. It’s such a shame their 3 month stint at BOXPARK is coming to an end on Sunday because they seem to be like part of the furniture now. The walls are adorned with Vogue and other glossy publication pages and you just want to sit in there all day admiring the layout. Do you think BOXPARK will let me move in? Have you ever been WAH’d?! If you’re in the Shoreditch area, why the heck aren’t you checking out BeautyMART at Boxpark? BeautyMART have decided to set up shop in the heart of London’s most happening venue and do you know what? They fit in perfectly. 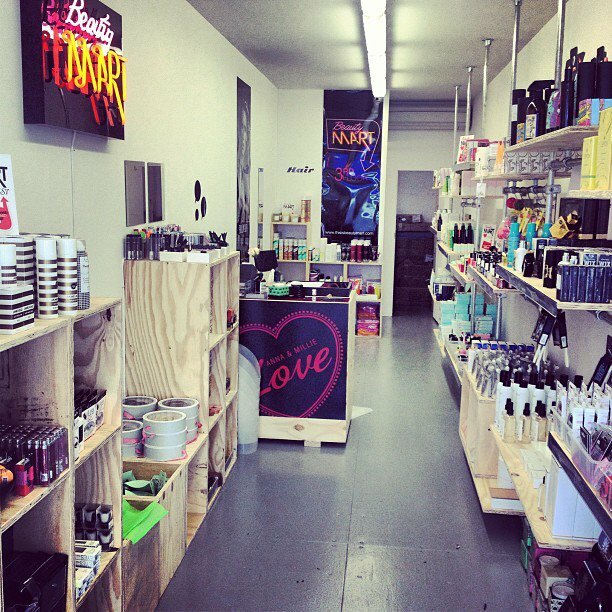 Boxpark has to be the perfect location to house the concept that BeautyMART pioneer so well. A hybrid of high-end and low-end industry adored loot. You know something is worth forking out for when Millie Kendall and Anna-Marie Solowij have given it their seal of approval, right? The atmosphere is so different from their Harvey Nichols backdrop. It’s like looking at all of the Knightbridge offerings but through fresh eyes. My personal favourites are the Face Stockholm treats and the notoriously hard to get a hold of Asian skincare offerings from DHC. Oh, and *disclaimer* if you didn’t have a nail polish addiction before, BeautyMART can’t be held responsible after you leave, the collection on offer is that good. Plus, if you didnt need more reason to check it out, BeautyMART are the exclusive stockists of Fashion House Balmain’s very first hair care range. Believe me, your hair will thank you for it. Everyone seems to be heading East to get a glimpse of the action. But be quick, BeautyMART are only at Boxpark for 6 weeks. Yes you heard it right, so what are you waiting for? Strap skates to those stillettos and get yourselves down to the most talked about venue in beauty right now…..